An interesting little shop on Creek Road in Greenwich, Made in Greenwich bills itself as a Gallery and Meeting Place, offering art of different sizes, shapes and mediums for sale or sight, with a strong focus on artists from the local area. 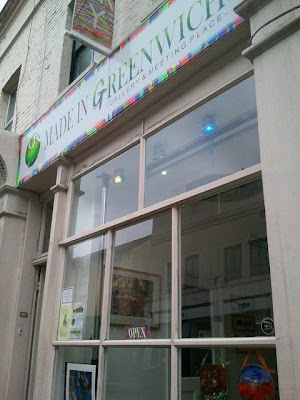 When your author popped in on Sunday it was a thoroughly participatory experience, and he was asked to help nail a picture hook up on the wall in the rear Hothouse gallery, and to join the Keep the Green In Greenwich campaign to save a nearby green space. The gallery is certainly worth a visit if you're in the area and is open six days a week (closed Mondays).